Eco choices are increasingly driving the decisions that consumers and businesses make, with more emphasis on environmentally friendly lifestyles than ever before. This is beginning to affect every sector, including logistics and delivery. Packaging is one of the biggest challenges for those looking to be greener in terms of business operations in the delivery sector, in particular reducing the volume of plastic that is involved in regular use packaging. So, what does taking a step towards reducing plastic packaging look like for businesses in the delivery sector? Innovations in packaging mean that there are increasingly more and more options for protecting goods in transit that don’t involve plastic. For example, some companies have begun to use popcorn as a packaging filler to protect and cushion items that are being sent inside of boxes. Others have invested in packaging that is made from recycled cardboard, for example, or other materials that are not brand new. Plus, eco friendly packaging choices are being developed all the time – one of the most recent is mushroom packaging, which mimics the effectiveness of Styrofoam but is a much greener choice and a far better packaging solution with respect to the environment. For the delivery sector, packaging of some sort will be essential for the foreseeable future. However, there is no doubt that many brands and shipping companies already use far too much of it. It’s quite common to see the “Russian doll approach,” which is essentially layer upon layer of packaging that may be protecting a rather small item on the inside. The issue with this type of packaging approach today is that many consumers tend to object to it, especially when some of the layers involved are made from plastic. 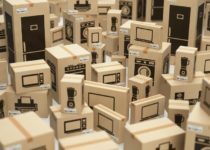 Increasingly, it’s becoming important for the delivery sector (and the companies making the products) to reassess how packaging is being used and where this could simply be reduced. A great reliance has developed on the use of plastic for deliveries, from plastic mailer bags to polystyrene packaging chips. However, as the damaging effect of excessive plastic use has become more obvious it’s clear that the sector needs to move on from an over-reliance on plastic and find other ways to protect goods in transit. For some, this means developing new and innovative packaging options, such as recyclable mailer bags that are not made from plastic. For others, it is a case of looking at the way deliveries are handled and managed, and making changes that would enable a switch away from plastic packaging as a result. There are many ways in which the delivery sector is responding to the need to reduce the use of plastic in logistics. From mushroom packaging through to minimal packaging options, it’s possible for every business to make a difference and to take steps towards making the industry greener. next post: How can you optimise your warehouse efficiency?